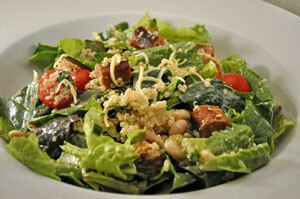 Salad with Sausage and Quinoa, Thyme for Cooking simple, healthy, salad. Quinoa adds both a delicious nutty flavor and lots of extra nutrition to this salad. If you prefer, you could use brown rice, small pasta, potatoes (cubed and roasted) or just leave it out. Reduce heat and simmer until done, about 15 minutes. When done, uncover and fluff. Cook sausages on barbecue grill 10 - 15 minutes or until done (can also be sautéed in nonstick skillet - same amount of time). When done cut in half. Peel carrot, then, with peeler, continue to thinly slice carrot until you reach your fingers. Wash and prepare greens as needed, tearing the large leaves. Put greens in a large salad bowl. Add 1/3 of the dressing and toss well with tongs to combine.